We were on a tight budget (like most people,) so my daughter agreed to let me make her cake. I had made wedding cakes for a short time when my girls were young but had forgotten so many details. Thankfully the web had so many recipes and ideas. 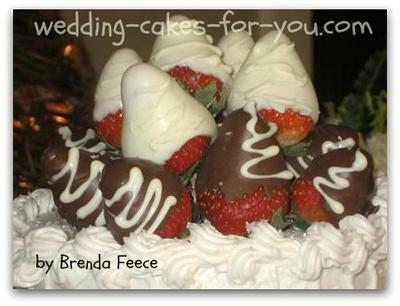 The chocolate dipped strawberries for a topper were a hit. We saved money by having an edible topper. My biggest mistake was assembling the cake before delivering. I should have taken a bag of frosting and arranged the strawberries on site. The tooth pics I used to dip the strawberries made it easy to arrange by inserting them. I picked medium sized strawberries and carefully washed them but not the stems. Then I allowed them to dry on a paper towel covered cookie sheet. I dipped them the morning of the wedding. The chocolate (white and milk) were the discs from Hobby Lobby. They were so easy to melt in the microwave. No adding oil, butter, paraffin or anything. I used a small writing tip and disposable bag and placed a small amount of chocolate inside. I had more control and fun decorating them after they were dipped. The dipped strawberries were place in an upside down colander by the toothpicks to dry. I took extra strawberries on my grandma's antique pink depression glass plate. These made a great appetizer before the food came. As you can see the cake slid and started to lean from the ride over so I suggest assembling the cakes and arranging the strawberries on site. I used a cake pedestal to add height to the cake as well. 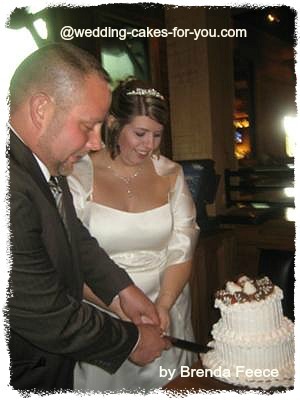 Brenda, Thank you for adding your daughters beautiful wedding cake with the chocolate dipped strawberry topper. You gave us a few tips that are very helpful like bringing a pastry bag with extra icing, just in case. I have made that mistake before. I like the toothpick idea also. Hadn't thought of that one. The upside down colander is a fantastic way to hold the strawberries right side up for drying too. Very helpful. The riser is beautiful and a great way to really give some height to a small cake and make it look more impressive. Waiting until the cake is set uo at the site before the final decoration is a good idea. I guess you found out the hard way. 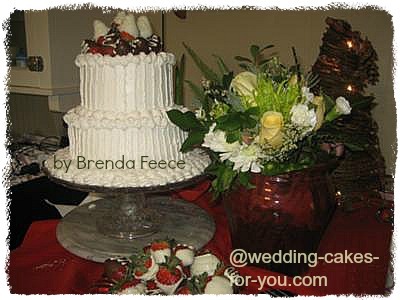 Your post will help a lot of DIY brides and cake decorators who are planning on making a wedding cake for the first time. Loved this gorgeous cake and the idea of an edible topper !!! !